Life seems pretty bleak post-November 9, and even moreso when you consider that 2016 has been declared the “deadliest year on record” for transgender individuals in America, with 24 trans people– predominantly women of color– murdered so far. This week, GLAAD’s Transgender Awareness Week continues, culminating on Sunday with the Transgender Day of Awareness. 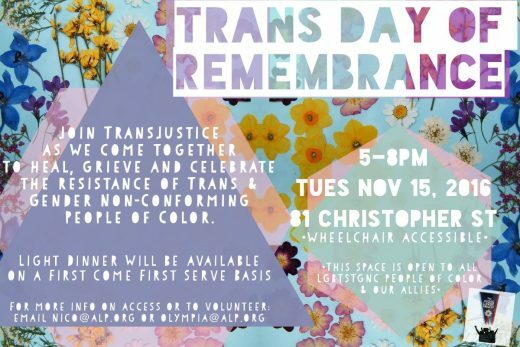 Founded in 1998 by a trans advocate in honor of trans woman Rita Hester’s memory, TDOR has been commemorated every year by vigils and other community-based events. Here are several goings-on this week, fun and solemn alike, that are either directly affiliated with Trans Awareness Week or serve to spotlight and lift up trans and queer individuals or groups.